Manchester City boss Roberto Mancini dismissed suggestions that the pressure on him had increased after Stoke dumped his side out of the FA Cup. Wednesday's 3-1 defeat means Champions League qualification is City's only hope of salvaging a stuttering season. Despite winning only twice in his last eight games, the Italian said he was "absolutely not" feeling the heat. "We had a good chance to go to the next round and the final but this is football, we must improve," he added. It was a miserable night for Mancini, who will be hoping his side, currently fifth in the Premier League, return to winning ways against leaders Chelsea on Saturday. But they look set to be without Emmanuel Adebayor at Stamford Bridge after the striker was shown a straight red card for raising his arm at Stoke defender Ryan Shawcross. The score at the Britannia Stadium was 1-1 when Adebayor was sent off and although Mancini's men held out for extra-time, goals from Tuncay and Shawcross earned Stoke a quarter-final tie against Chelsea. "I'm disappointed because we lost," added Mancini. "My opinion is that we played very well. We dominated the game and had six or seven chances to score a goal before the sending off of Emmanuel. "Until the situation it was our best performance in the last three or four games. Manu played very well, fantastic. For me - maximum yellow card. It was not so dangerous." It was the third time the two sides had played out 1-1 draws over 90 minutes over 12 days. The defeat by Stoke was City's fourth since Mancini replaced Mark Hughes in December. In that period, City fans have also seen their side lose a Carling Cup semi-final to local rivals United and the team have only climbed one spot to fifth in the Premier League, hardly the progress City's owners, the Abu Dhabi United Group, would have been wanting from the former Inter Milan boss. 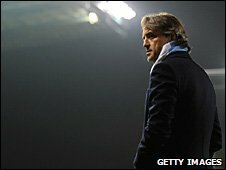 There have also been problems for Mancini off the pitch with Brazilian striker Robinho heading off to Santos in a loan deal and reports of a bust-up with striker Craig Bellamy over training methods, while forward Carlos Tevez has been in Argentina on compassionate leave for the last fortnight. Despite that, Stoke boss Tony Pulis described City as "a team of unbelievable resources and quality" and he was understandably elated by a victory which saw his side reach the Cup quarter-finals for the first time since 1972. "We have managed to come out on top, so we are delighted, really pleased," he said. "In the first half I thought Thomas (Sorensen) kept us in the game. He made a couple of great saves, but second half and through extra time I thought we were the better team."